schiller-wine: Christian G.E. Schiller - Publications, Interviews, References et al. Christian G.E. Schiller - Publications, Interviews, References et al. This is a living document which is being updated on a regular basis. December 2014, Weinfeder Vol. 45 contains my article "Wein in Madagaskar"
October 2014, Weinfeder Vol. 44, Die Deutsche Weinprinzessin Sabine Wagner auf Ostküsten Tour in den USA, page 19. February 2014, Weinfeder Vol.42, Die “Digital Wine Communications Conference 2013” in Rioja, Spanien, page 25. September 2013, Weinfeder Vol.40, Riesling Rendezvous in Seattle, page 30. October, 2012, Northern Virginia Magazine, Wine Recs from Local Winos, page 51 and online. November 19, 2013, vino 365, Il Blog di Cantina di Soave, I was Cantina Sociale de Soave’s Wine Blogger of the Week: #DWCC : Comunicatore Digitale della settimana – Christian Schiller, with a video interview. November 13, 2014, Bass River Winery in their e-newslette: The very friendly Christian and Annette Schiller we're amongst our guests. Christian runs an international wine blog website known as Schiller Wine and very kindly wrote an article on the dinner you can read his article here. We look forward to seeing Christian and Annette in Australia in 2015. February 2014, MacArthur Beverages in Washington DC, put a hyperlink on their website in the section "In the Blogs", referring to my posting on the recent Chateau Calon-Segur tasting, along with links to the blogs "Hogshead" and "Connection to Wine". July 1, 2013 on his blog La Gazetta del Vino, Philipp Erik Breitenfeld releases a posting about the 2013 VinoCamp in Germany, with a picture of Dirk Wuertz and him, subtitled: Dirk Würtz und Christian Schi... äh der Direttore. April 5, 2013, Damien Casten of Candid Wines, Chicago, on his facebook page: Doing research for an upcoming trip to Germany and at every turn, google points me in the direction of Christian Schiller and his Drinking German Wine in America. Well done, Christian! On March 7, 2013, the Drink Local Wine Blog had a couple of paragraphs, following my posting on schiller-wine about the upcoming Drink Local Wine Conference in Maryland. December 29, 2012 on vinicast: …Y más Brindis de fin de año por el mundo An article about what wine bloggers all over the world had for the holiday season, including myself. December 24, 2012 on LC Lars Carlberg Mosel Wine Blog: Unlocking the Kabinett A very detailed and long article that discusses some of the positions that I have taken on schiller-wine with regard to dry and sweet-style German wines. 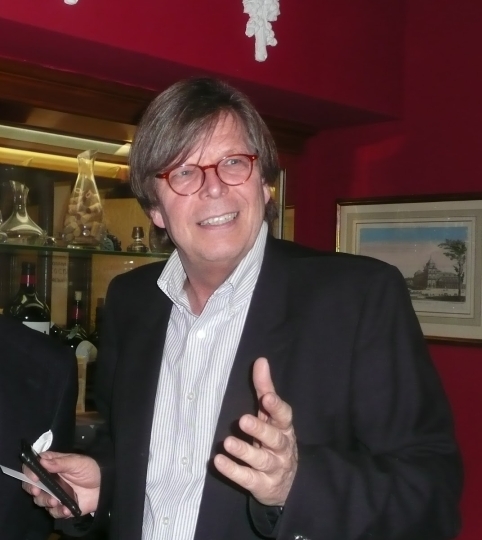 November 2012, Luiz Alberto at The Winehub created "My Christian Schiller Moment of the Day" - a picture of Luiz and another wine personality. He issued on facebook an Album with 16 such pictures, all taken at Mount Etna and called the Album "My Christian Schiller moments .."
July 24, 2012, Chicago-based Damien Casten - co-founder of Candid Wines – posted an article on his wine blog, in which he directs his readers to a posting on schiller-wine. In his words, this posting is “the only guide to German Riesling you’ll ever need to read.” See: “The only guide to German Riesling you’ll ever need to read” or The only guide to German Riesling you’ll ever need to read. July 2012, Virginia Wine Lover Magazine, Reasons to Rais a Glass - 5th Virginia Wine Lover Magazine Wine Classics, pages 20 to 25. October 14, 2011, Austria Wines USA - Newsbites: Dr. Christian Schiller shares one of his amazing experiences with us – the kind that always leaves us jealous! – this time with Leo Hillinger in Virgina. What did they eat? With which wines did they pair? Read on to find out. May 12, 2011, Grand Cru's Kai Buhrfeindt in Frankfurt am Main recommends "schiller-wine"in his newsletter.